Unique handmade LadybugsThere are 16 products. Unique handmade and original Ladybugs from Unikatnica are a collection of handmade earrings. You can find them in different colours: in red, orange, yellow, green, blue, violet, pink, gold, silver, metallic, translucent, black, white, pearl and cyclamen. 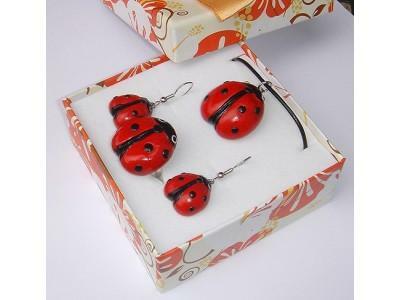 All unique handmade Ladybugs are made from skin friendly materials which are nickle-free and also suitable to be worn by people with allergies. Unique, original and handmade Ladybug earrings in white and black colour. Each Ladybug is made from Cernit and Fimo clay, suitable for birthday, holiday and business gifts. Unique, original and handmade Ladybug earrings in dark pearl-black colour. Each Ladybug is made from Cernit and Fimo clay, suitable for birthday, holiday and business gifts. Unique, original and handmade Ladybug earrings in silver and black colour. Each Ladybug is made from Cernit and Fimo clay, suitable for birthday, holiday and business gifts. Unique, original and handmade Ladybug earrings in white translucent and black colour. Each Ladybug is made from Cernit and Fimo clay, suitable for birthday, holiday and business gifts. Unique, original and handmade Ladybug earrings in gold-yellow and black colour. Each Ladybug is made from Cernit and Fimo clay, suitable for birthday, holiday and business gifts.